FALL ROYALTY. Six members of the Valley Heights graduating class of 2018 are named candidates for Homecoming 2017. Your 2017 Homecoming King candidates are Harrison Blaske, Dalton Joseph, and Bryan Yungeberg. Your 2017 Homecoming Queen candidates are Allison Jones, Shea Manley, and Kayla Smith. Allison Jones, queen candidate, comments, “being up for homecoming is really cool. I’m very humbled.” The Homecoming parade will take place September 15 at the Blue Rapids Town Square. 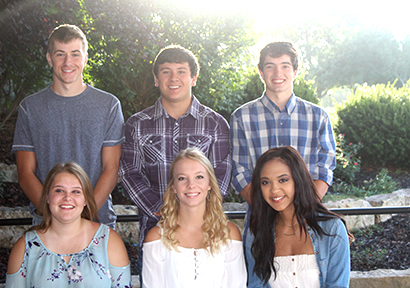 All six candidates will be featured there and at the football game Friday night where the King and Queen will be crowned at halftime. We hope everyone comes out to support the Mustangs!